In case you’ve been living under a rock, Instagram has turned into kindof a big deal. Instagram isn’t just for fitness models doing lunges or hipsters taking pictures of their vegan meals. 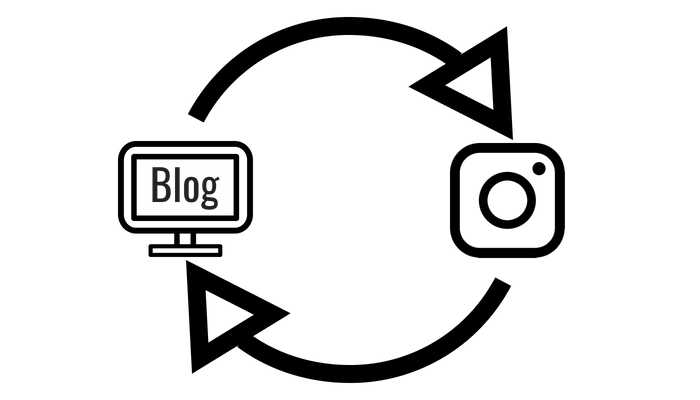 It has become an extremely valuable resource for bloggers. All bloggers should be promoting their content across social media and Instagram is on its way to becoming the king of them all. The bad news is that growing your following on Instagram isn’t easy. The good news is that if you already have a blog, you have a serious head start. Remember, once someone has left your site, the odds are extremely low that they will ever come back. Don’t take it personally, it’s just how it is. There is a lot of competition for our reader’s attention so when we get it, we need to make sure we make it easier to re-engage them later. 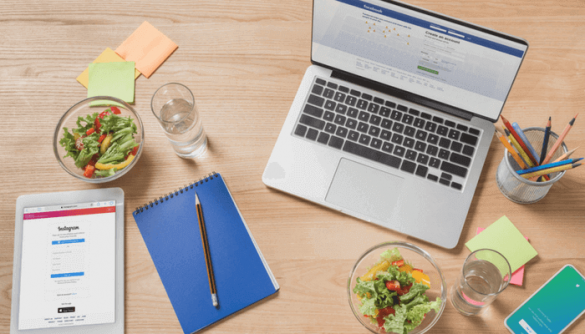 If we can turn visitors into social media followers, we can increase the chances of them revisiting our blog because we have a new way to get their attention again. We can’t rely on them typing in our URLs into the search bar. We need to stay top of mind. Here are 5 proven methods to ensure that you turn blog visitors into Instagram followers. 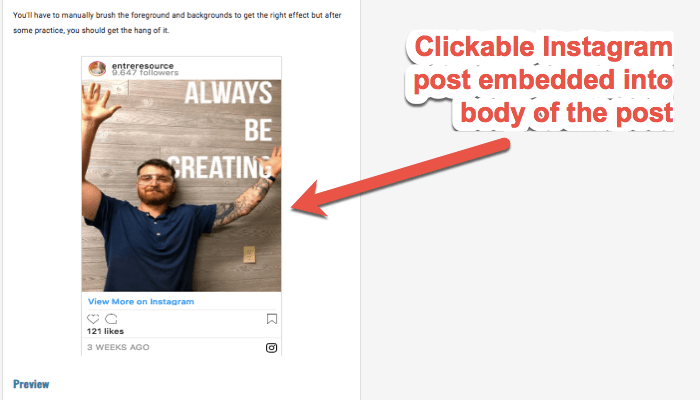 Images liven up blog posts, so why not kill two birds with one stone by embedding images directly from your Instagram account? It is clear that Instagram wants their users to embed their posts because they make it extremely easy. Here is how to get the embed code for any of your Instagram posts. It is really easy and this shouldn’t negatively impact site load speed. You can let your blog visitors see your latest posts and even scroll through your recent uploads. There are a number of widgets that can do this. The one that I use is called Instagram Feed Pro. There are free and paid versions. This is a gutsy approach because you’d be asking for an Instagram follow instead of offering a lead magnet to get an email opt-in. One advanced work around here is to create a rule (assuming you use a pop-up software that allows for this, most do) that shows an Instagram pop up to visitors who have either already subscribed to your list or have already been shown your pop up. If you have an email list (you absolutely must build an email list by the way) you should be sure to ask them to follow you on Instagram. You’d be surprised how many followers you can get just by hitting your list and asking them to! As a bonus, you can run contests to your lists and offer some sort of prize to anyone who follows you within a certain number of days. If you want to REALLY kick things up a notch, you can add an email encouraging subscribers to follow you on Instagram to an email onboarding sequence. This means that every person who subscribes to your email list will also be encouraged (eventually) to follow you on Instagram. This is a great way to automate your growth and to ensure that your new subscribers also follow you on Instagram. One final spot you can add an Instagram call to action is on your author bio (which should appear on every one of your posts). Following someone on Instagram is a great way to get to know them better and many of your fans will follow you if you remember to ask them to. There you have it, five actionable ways to use your blog to grow your Instagram following! Did I miss anything? Be sure to tell me in the comments below. Don’t forget to follow me on Instagram @entreresource if you want to see first hand how I use my page to grow my blog traffic! Nate McCallister is a full-time blogger who covers topics including fitness, lifestyle design and digital marketing. Follow him on Instagram @entreresource and read more of his internet marketing and blogging tips on his site entreresource.com.